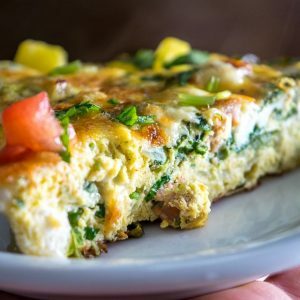 If your weekly grocery list includes Mexican cooking ingredients then most likely you’ve already got everything you need to make a zippy Mexican Frittata. 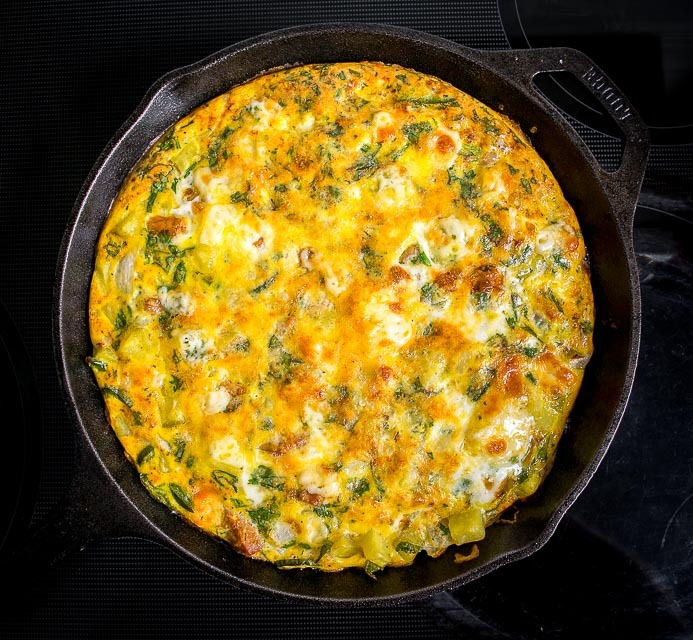 Frittatas are wildly versatile, and while many chefs will use them to showcase exotic flavor combos, the truth is they seem to work best when they are partnering up with the vegetable drawer in your fridge. In other words, additional trips to the grocery store aren’t required, you can use what you have and most likely you’ll be a very happy camper. 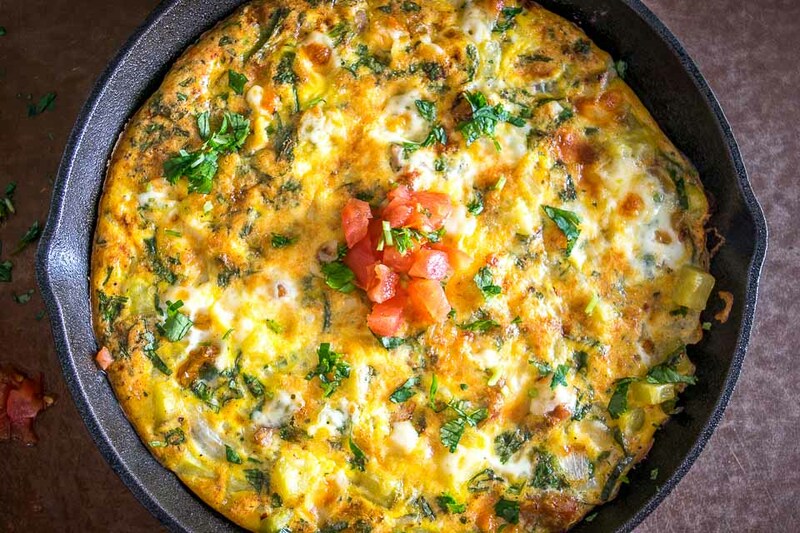 You can also use this Mexican Frittata as an alarm clock for lazy weekend mornings — once that oven timer goes off all the work is done and the grumpyheads will come out of the woodwork hoping for a slice. It seems easiest to use an oven-safe skillet for this recipe but you could always transfer everything to a baking dish if necessary — just keep in mind that you’ll probably have to add a few minutes of baking time if you go that route. 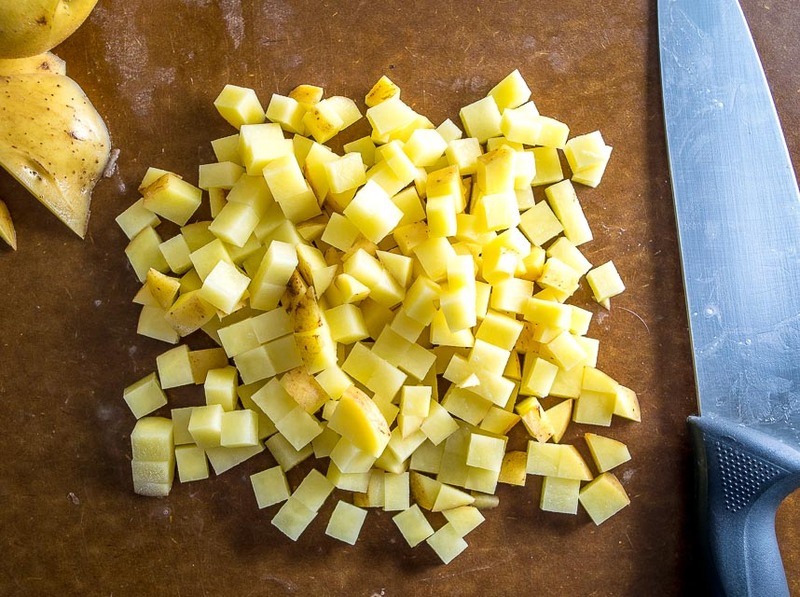 And if using potatoes you’ll have to pre-cook them a bit to ensure they’re done after the baking period. Latley I just finely cube the potato and plop them in a pot of salted boiling water for 4-5 minutes. Ideally you take them out and drain them when they’re still a little firm as they’ll finish cooking with the rest of the frittata. Using two jalapenos will definitely create some heat so feel free to dial back on those if you want a milder version. Lately I’ve been noticing quite a difference in heat level from similar looking jalapenos; most likely due to age and growing conditions. 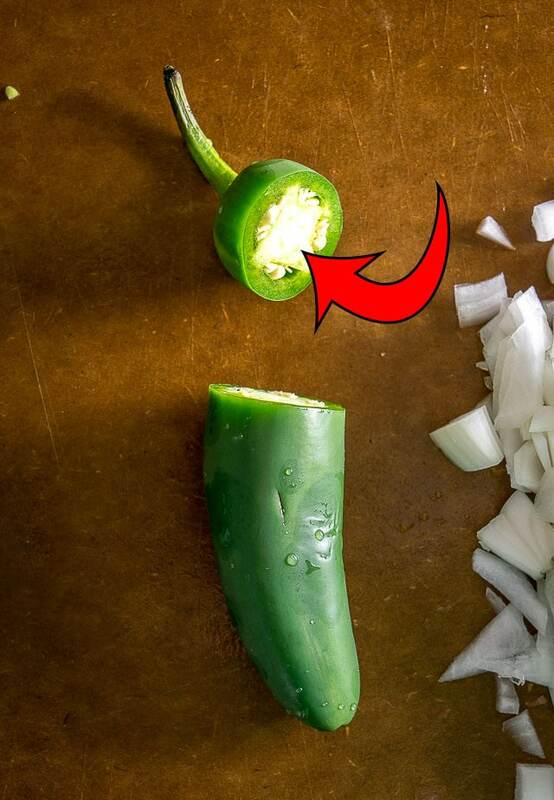 For the adventurous, a quick way to gauge the heat of your jalapenos is to cut off the stem and stick the tip of your tongue in the center of the pith. 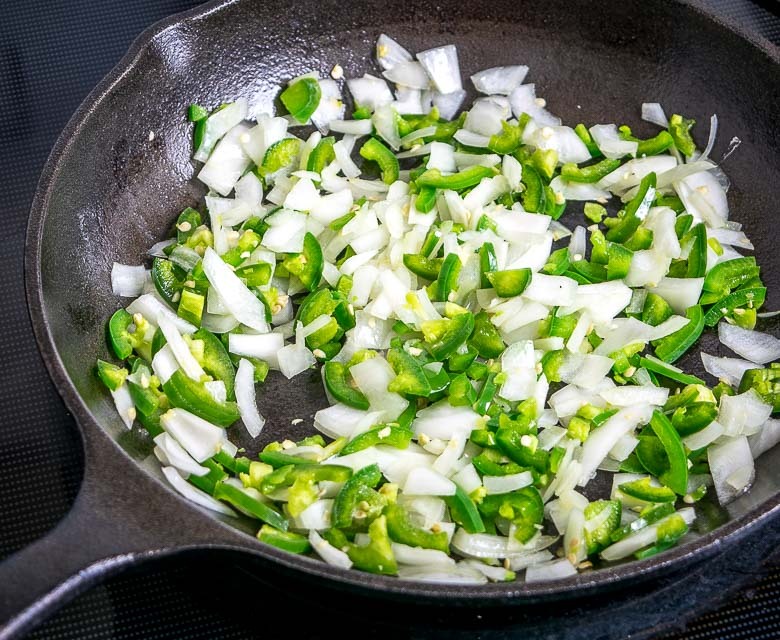 Do this consistently and you’ll get a quick snapshot of the jalapeno’s heat relative to previous batches. Not recommended with habaneros or other fireball peppers! Okay, finely chop the jalapenos and 1/2 onion. Saute over medium heat in a healthy dollop of oil. This is a single link of chorizo sausage that I partially cooked in the oven to speed things up, but you can definitely cook raw sausage in the pan if you want to. Once the chorizo is fully cooked, add the potatoes. 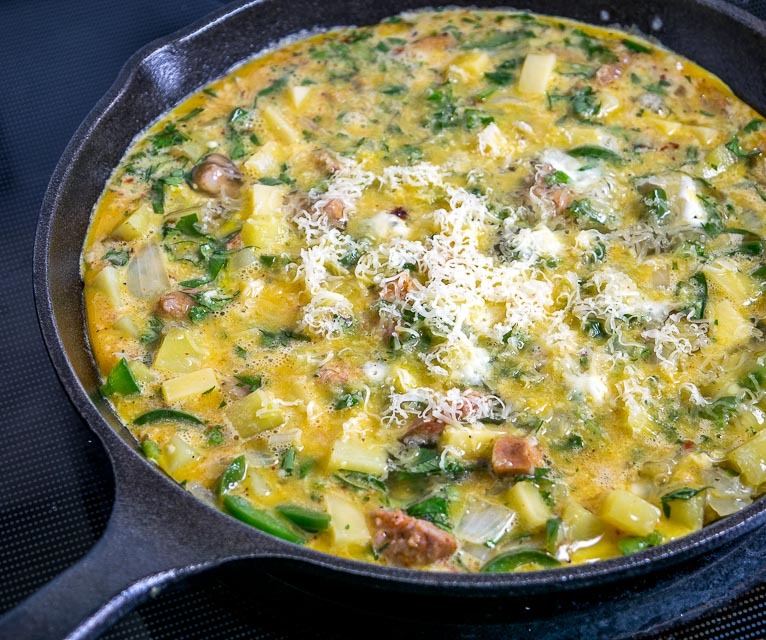 I only used about 2/3 of the potatoes for this particular frittata as that seemed to create a good balance. Season liberally and cook briefly, bringing everything up to uniform temp. This will give you time to whip up the egg mixture. Give it a good mix and then add it to the saute pan. Use a spatula to even things out, letting the eggs fill in the gaps and seep down to the bottom of the pan. I plopped in little globs of cheese at this point and also shredded some Jack cheese over the top. This will go in a 350F oven for 10-15 minutes. I typically finish it under the broiler for a couple minutes as it seems like that’s an easy way to even out the temp across the center. This batch was baked for about 12 minutes and put under the broiler for an additional 90 seconds or so. 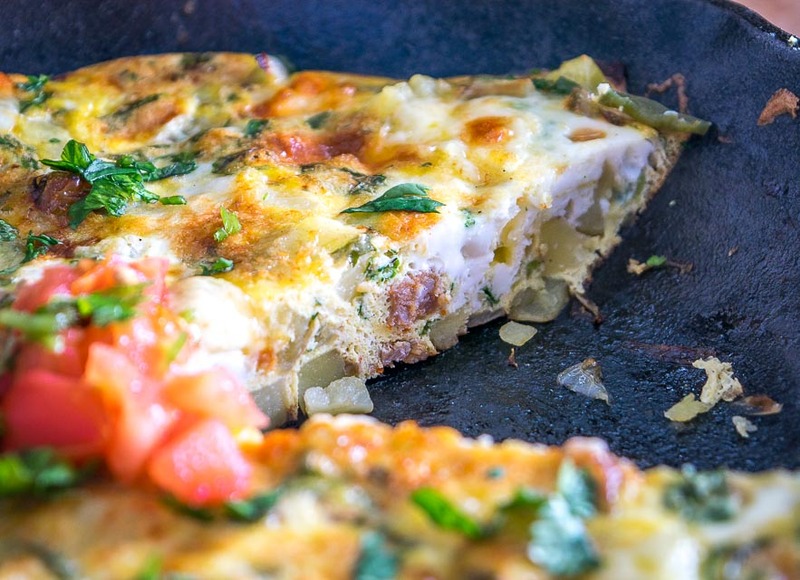 And just like that you’ve got a Mexican Frittata alarm clock on your hands! Feel free to add fresh garnish but it’s ready to go if you want to dig in. A few drops of hot sauce seem to be the perfect final touch and lately for me that means Valentina. If all went according to plan you’ve got a flavorbomb Frittata that should come out of the pan quite easily. If you’ve got grumpyheads slumping into the kitchen table then this recipe has done its job. Soon they’ll be Mexican Frittata converts for life! 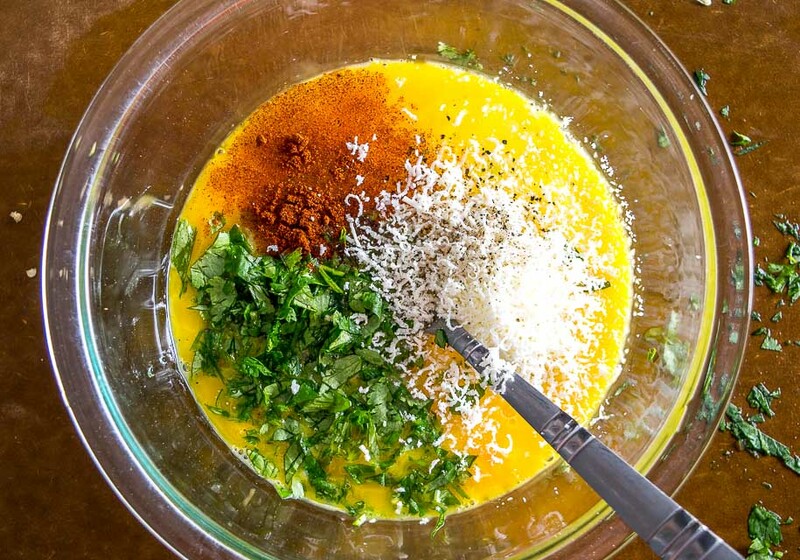 Okay don’t forget that this Mexican Frittata is wildly versatile. I’ll put the recipe box below with the specifics I used for this batch, but feel free to partner up with your vegetable drawer and craft a version that works best for you. Scroll down for the recipe box, and feel free to use the comments section if you have questions or want to leave feedback on this recipe. For up-to-date recipes follow us on Facebook, Pinterest, or Instagram. 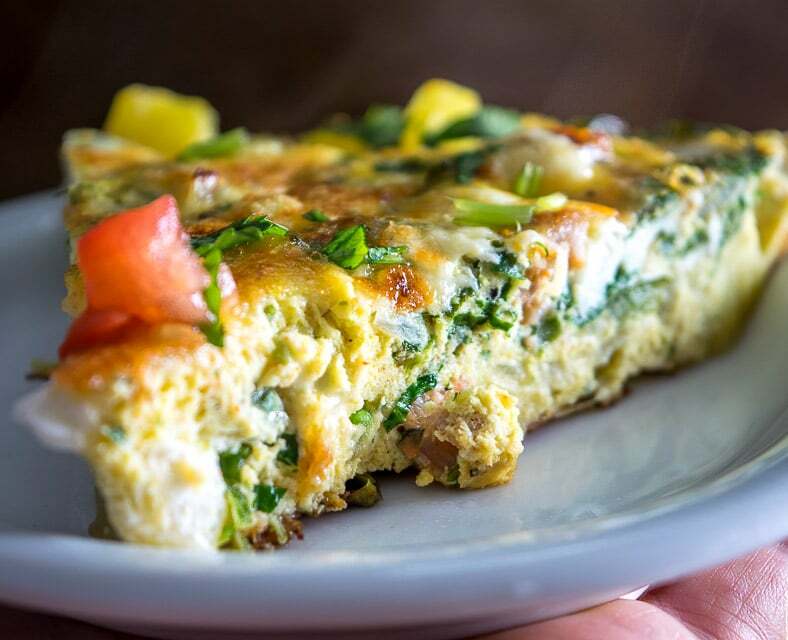 Here's an easy, versatile recipe for a zippy Mexican Frittata. 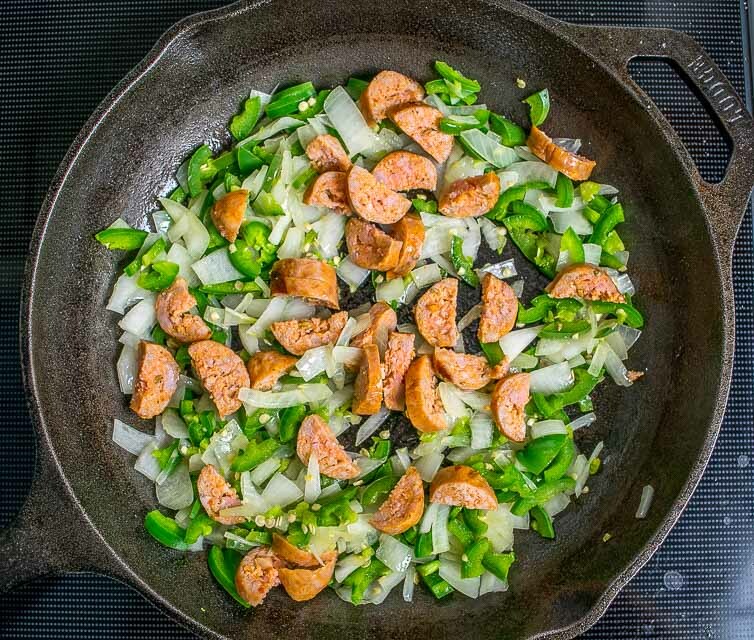 I find the chorizo-jalapeno-cheese combo irresistible but you can always make a vegetarian version too. So good! Finely cube the potato. Add it to a pot of salted boiling water and parboil for 4-5 minutes. Drain and set aside. Ideally they are still a little firm as they will finish cooking in the frittata's baking period. Finely chop 1/2 onion and 2 jalapenos. Saute in a dollop of oil over medium heat until tender, approx. 5-8 minutes. For the egg mixture, crack ten eggs in a mixing bowl and combine well. Add 1/2 cup of chopped cilantro, 1/2 teaspoon chipotle powder (optional), 1/2 teaspoon salt, freshly cracked black pepper, and shredded Cotija cheese (optional). Combine well and add the egg mixture to the saute pan. 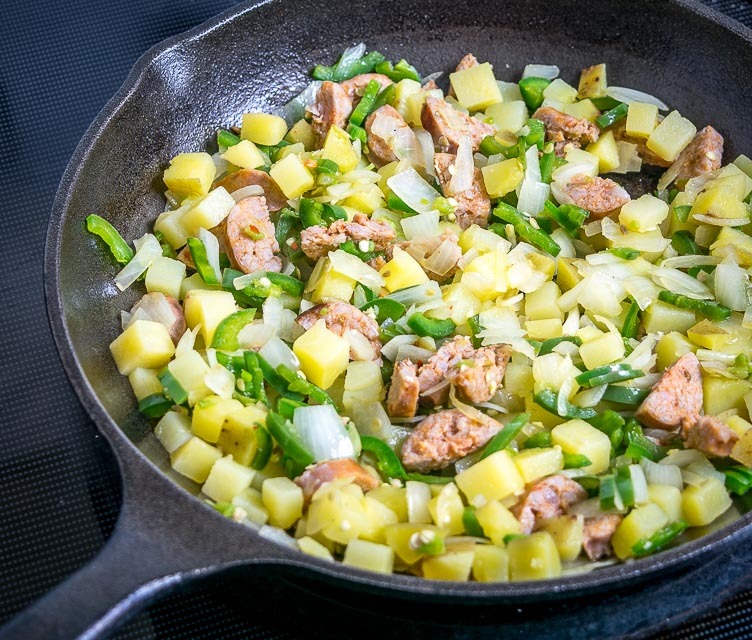 Use a spatula to even things out in the saute pan, letting the eggs fill the gaps and settle to the bottom of the pan. Add 1/2 cup of cubed cheese (I used Jack), and you can also optionally add a layer of shredded cheese on top. I baked this batch for 12 minutes and then finished it under the broiler for approx. 2 minutes; this can help even out the temp across the center. Once cooked, slice it up and serve immediately! Feel free to top with fresh garnish and a few drops of hot sauce. Store leftovers in an airtight container in the fridge. This is bound to show up at breakfast soon- I always like a good vehicle for hot sauce. Thanks! Cheers Jeremy, I hope it treats you well! Hi Patrick! Can you give an approximate weight on the chorizo? I cook with bulk chorizo, & have no idea how much a link weighs. Thanks in advance. Can’t wait to try this! Sure Esther thanks for mentioning this I will add the weight to the recipe box. I used a single chorizo link that was just under 1/4 lb. or approx. 100 grams. Cheers. Growing them (backyard) in So. Cal. I noticed two things.. 1. I don’t have green thumb. 2. That’s a good thing because I would forget to water them from time to time and they became stressed — that stress made for some really hot peppers. What I noticed, physically on the hotter peppers, were slight wrinkles near the stem and short white lines/striations. Also to a lessor degree was the lighter colored peppers were somewhat mild and the deeper greens were hotter. Never noticed a heat difference between the deeper greens and reds. Hope that helps, thanks for the always delicious recipes, take care. Thanks much for the tips John! Wow that is fascinating to think that a stressed pepper would have completely different capsaicin levels than a comfortable pepper. Coincidentally I’ve been reading about intermittent fasting over the past few weeks and there is a similar theme running through that realm i.e. regularly depriving the body of food (instead of eating all day long) can result in a healthier body. Definitely counter-intuitive but really fascinating to read about. Cheers. Looks delicious! Glad I’m not the only who uses the lick test to check chile heat! Ha awesome Julie, good to know there are others out there! My goal this weekend is to come up with a few good ‘breakfast burritos’ that I can freeze and reheat. One of the techniques I’ve been thinking about is to cook the eggs thinly so they’ll basically be another rolled layer, or to cut into long strips so you don’t end up with clumps and bunches. (Not a terrible thing, of course). 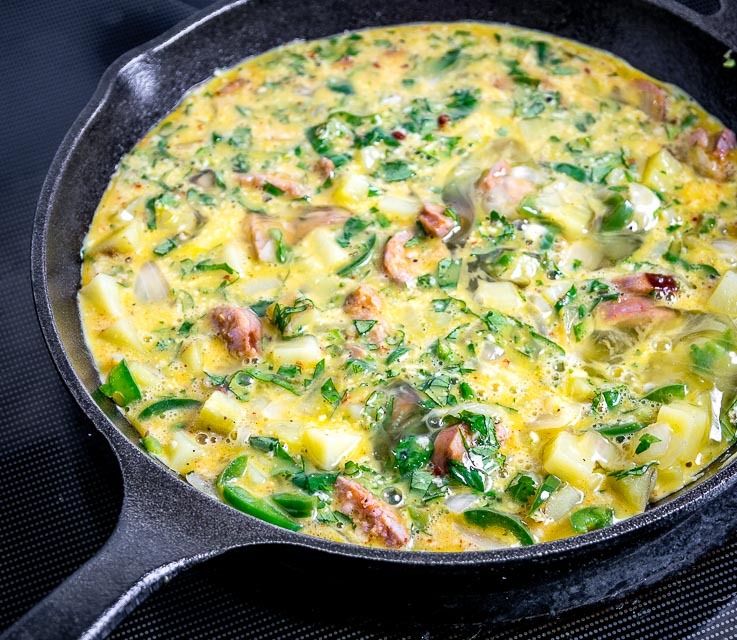 This frittata looks like a *great* starting point for that. (And it looks great just by itself too, of course.) Gonna give it a go, making it thinner. Then maybe putting some chicken tinga + a little extra cojito. BTW: I pre-cook / par-cook my diced potatoes in the microwave with a wee bit of water (a couple of tablespoons or so for a really bit potato). (I do the same with diced sweet potatoes, which take longer since they’re denser..) I generally get those going first then by the time they’re ready, I’ve got my onion & garlic saute going and can toss the potatoes in. Quicker than gettting a pot of water up to a boil, and much cooler in the summer in an un-air-conditioned apartment! Will look forward the frittata later today! Thanks for your notes Ashley, especially the one on par-cooking your potatoes in the microwave as I’m slowly but surely using the oven and stove-top less as the summer heats up.